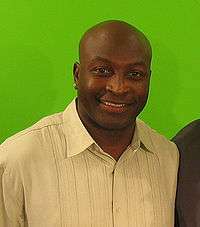 Otis James McDuffie (born December 2, 1969) is a former American college and professional football player who was a wide receiver in the National Football League (NFL) for eight seasons. He played college football for Penn State University, and earned All-American honors. A first-round pick in the 1993 NFL Draft, he played professionally for the NFL's Miami Dolphins. McDuffie was born in Marion, Ohio. He attended Hawken School in Gates Mills, Ohio, excelling in football, basketball, track and field and baseball. He set Hawken's record for all-purpose yards with 7,302 in his high school career. In 1986, McDuffie returned an interception 108 yards, an unofficial Ohio state record. During his senior year in 1987, he was named the A-AA Ohio Player of the year. For the 1987 high school football season, he scored 136 points (21 touchdowns) ahead of future professional football players Desmond Howard and Robert Smith. His number 32 is retired at Hawken School and The News-Herald named McDuffie the number 3 player of the 20th century in Northeast Ohio. Memorabilia from McDuffie's days playing Marion Midget Football are featured in an exhibit entitled "A Passion to Play" at the Marion County Historical Society. McDuffie attended Pennsylvania State University, and played for coach Joe Paterno's Penn State Nittany Lions football team. He wore the number 24 for the Nittany Lions. He set several single-season and career receiving records, as well as all-purpose yards records. His performance in Penn State's 1992 Fiesta Bowl victory over Tennessee on January 1, 1992 garnered him the game's offensive MVP. McDuffie also played one season of varsity baseball in 1990 while at Penn State. He still holds the PSU record for stolen bases in a single game with 4, and is in the top 10 for stolen bases in a single season. McDuffie was drafted by the then California Angels in the 41st round of the 1991 Major League Baseball Draft but did not sign. He earned a Bachelor of Science degree in labor and industrial relations from Penn State in 1992. The Miami Dolphins selected McDuffie in the first round (25th pick overall) of the 1993 NFL Draft. He returned punts and was a reserve wide receiver before earning the starting spot for the Dolphins. During his formative years with the Dolphins, McDuffie became known as Dan Marino's favorite receiver. His 415 career catches are fourth all-time in Dolphins history. In 1998, McDuffie caught 90 passes, leading the NFL in that category. He is the only Dolphin to achieve this mark. With the exception of Mark Clayton and Mark Duper, McDuffie caught more passes thrown by Dan Marino than any other Miami Dolphin receiver. He played his entire career in Miami, retiring in 2000 because of a nagging toe injury. Nearly ten years later, McDuffie would win a Medical malpractice lawsuit related to that career-ending toe injury. On May 5, 2010, Miami-Dade County, Florida jurors ordered a former Dolphins team physician, Dr. John Uribe, to pay McDuffie $11.5 million in damages. The lawsuit alleged Uribe told McDuffie he was safe to continue playing football, despite MRIs showing damage to the tendons in his toe. On September 30, 2010, Judge Michael Genden of Miami-Dade County tossed out that verdict due to the improper use of a medical manual as evidence. The judge also ordered a new trial. McDuffie was formerly a radio personality for WAXY, an AM sports radio station in South Florida and is now a sports blogger at OPENSports.com. He is also the founder and chairman of the Catch 81 Foundation, an organization created to raise money for children's charitable causes in the South Florida metropolitan area. He was inducted into the Dolphins Walk of Fame on December 29, 2013. Recently in 2015 he was inducted into the Hawken School Athletic Hall of Fame. ↑ Kyre, Brenda (2008-11-24). "State Records, Football". The Ohio High School Athletic Association. Retrieved 2008-11-30. ↑ Steven, James (2008-11-30). "A Passion to Play". The Marion Star. Retrieved 2008-11-30. ↑ "McDuffie awarded $11.5M in toe lawsuit". Associated Press. 2010-05-05. 1 2 Neal, David (2010-05-06). "Former Miami Dolphins' O.J. McDuffie gets $11.5 million". The Miami Herald. 1 2 "O.J. McDuffie Stats". ESPN Internet Ventures. Retrieved 27 May 2014. ↑ "About Catch 81". Catch 81 Foundation. Retrieved 2010-04-21. ↑ "Dolphins Add Four To Walk Of Fame". dolphins.com. 2013-12-10.